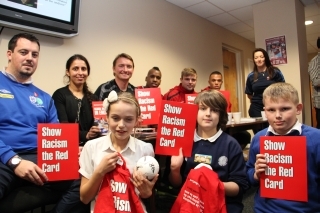 Show Racism the Red Card returned to Glanford Park for an educational event with Scunthorpe United FC for Year 5&6 pupils from local schools. Young people from Alkborough, Eastoft and Lincoln Gardens Primary Schools were able to come to the stadium and take part in educational activities run by the campaign. In the first hour of the event, SRtRC ran educational activities which explored stereotypes and how they are formed, a definition of racism and the use of terminology. The young people readily participated in the activities and contributed intelligently to discussions about racism and the related issues. After the first hour of the event, the audience was joined by Scunthorpe United Assistant Manager and SRtRC Honorary Patron Chris Brass and three of the SUFC players Damien Mozika, Aron Wint and Matt Godden. The special guests were able to join the young people in watching a screening of the SRtRC film and prepared to take questions on racism from the audience. Joining the Damien, Aron, Matt and Chris on the panel was Paul Hamnett, Football Development Officer at Lincolnshire FA and Farzana Khanum, Equality & Diversity Officer at North Lincolnshire Homes. There was no shortage of questions put to the panel and they were all very well thought out. Scunthorpe United Sports and Education Trust filmed the Q&A and it would be good to see this footage, the questions and answers were brilliant. The panel’s favourite questions were awarded SRtRC goodies including t-shirts and mini footballs and some prizes from SUFC including a special travel mug and SRtRC posters signed by the whole club. All of the young people in attendance were able to receive a SRtRC / Scunthorpe United poster signed by the players and Chris and a SRtRC goody bag including the new magazine. SRtRC would like to thank Scunthorpe United FC and the SUFC Sports and Education Trust for hosting the event and supporting the campaign. Big thanks in particular to Sarah Teal and to all of the schools for attending.